4 bedroom, 4 bathroom cabin with stunning sunset views across the lake! For the summer of 2019: Following an extensive remodel addition, the cabin will be able to sleep 12 people, with a new bedroom and bath! Also, given the size of the small, beautiful lake, rental guests will be asked to refrain from wake-making activities... boating/fishing will be certainly fine, but given the high water levels and the erosion that can be created by excessive wave action, water skiing and jet skiing will be prohibited... thank-you for helping us take good care of Clear Lake! Stacy really enjoys managing this beautiful cabin for the owners! They were so excited when they purchased this beautiful cabin in the fall of 2016... they enjoy active lifestyles: their passions include bicycle riding, Nordic skiing, golfing, fishing, and mountain biking. With all of those activities available so close by to their cabin, they are looking forward enjoying the cabin themselves and to sharing this beautiful spot with their rental guests as well! The owners were attracted to the Hayward/Cable area because of the many outdoor activities and festivals... including the Birkebiener Ski Race, the Chequamegon Fat Tire Festival, the International Lumberjack Championship, Musky Fest, Hayward's Fall Festival, summer music concerts, etc! The location of Clear Lake Lodge was particularly appealing because of its' public access boat landing, proximity to trail heads (3 miles), to quiet well-paved roads, golfing, and an abundance of great restaurants. 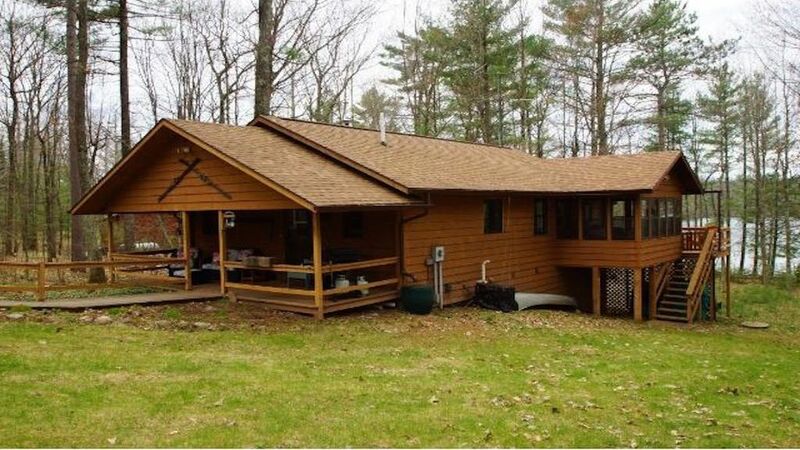 The Lodge itself is located on a large, wooded, gradually sloping, westward facing lot that offers terrific sunsets while enjoying fishing off of the private dock on beautiful Clear Lake. Clear Lake Lodge offers 1,700 square feet of living space that can comfortably sleep up to 8 people. It features two gas free-standing fireplaces, knotty pine, a beautiful newly renovated kitchen, a fun game room with ping pong and darts, etc., and is tastefully decorated for a cozy Northwoods cabin feel... There are "quiet times" on the lake (with motorized sports being allowed only between the hours of 11:00 am and 5:00 pm) which help the owners think of Clear Lake Lodge as a type of sanctuary... offering respite from their busier city life- stepping through its' doors produces instant relaxation... it is truly their "Happy Place"! toilet, combination tub/shower, The new Master Bedroom will have a new Master Bathroom! toilet, shower, As of the summer of 2019, the cabin will have 4 bathrooms! Clear water with sandy frontage, with a swimming raft! Comfortable seating on sectional sofa and chairs near gas fireplace. Beautiful stainless appliances and granite countertops! There is plenty of room for outdoor yard games and fun! Arrangements can be made for fishing or pontoon boats to be delivered right to the dock! The owners and their neighbors really appreciate the privacy and quiet of their property on Clear Lake, and they ask that rental guests respect this and not use any jet skis while staying at the cabin... there is also a Motorized Activity Restriction on Clear Lake- with wake-producing activities permitted (water skiing, etc.) only from 11:00 am to 3:00 pm... thank-you! Well appointed lake home on quiet, clear lake. Clear Lake is crystal clear and the house is well thought out for guests. All 3 queen sized beds were comfortable, 2 modern bathrooms (one shower over tub and one shower stall) with storage and counter space, beautiful kitchen with new, high end cabinets and full sized appliances (including dishwasher) and cookware, dishes, basic supplies included. Freezer has an ice maker that was handy. We cooked all but one meal using the stove burners, oven, broiler, and outside grill. All worked well. Large dining table for eating. If we had had nicer weather we probably would have eaten outside on the deck tables. As it was, we sat out there a lot when the sun was shining. Screen porch turned into an afternoon nap place. We had a week that required both AC and heat and everything worked well at the touch of the thermostat. Dock (oops, sorry, pier for you Wisconsin folks) and swim raft made access to lake swimming easy. Bottom is sandy, a few weeds, but, hey, it’s a lake! We used the canoe, kayaks, and paddle board. The lake was quiet, even on Labor Day weekend, and I think that’s the way everyone likes it. This was excellent size space for our group of three couples, one baby, and one dog. The view of sunsets over the lake was wonderful and the house is well spaced from neighbors. Lots of beautiful pine (white and Norway) and deciduous (oak and maple) trees all around. S’mores around the campfire on our last evening was a fine ending to a great week. It was hard to leave on Saturday morning. It's so wonderful to know that you and your friends had such a great time at Clear Lake that you found it hard to leave, Greg! It sounds like you were able to make use of all the amenities the cabin has to offer. We are very happy that you enjoyed the peacefulness of the lake, the beauty of the northwoods and some lovely sunsets. We would welcome you back any time! Exceptionally appointed and meticulious clean. Have stayed at many VRBO rentals and have to say Clear lake Lodge was the cleanest and most well appointed with everything you need to enjoy your stay...even has a waffle maker!. Felt at home with the comfortable furniture, cabin decorations, beds incredibly comfortable, deck overlooking the lake was great, etc. The lake is small but very clear and quiet. The loons were calling each morning and night...wonderful! Patrick, we are pleased to hear that you enjoyed all the accommodations at the Lodge. We are so happy that you enjoyed the quiet and were able to experience the calls of the loons.....always a very special treat! My family was Blessed to have spent the week here at this house! Our family enjoyed the beautiful view of the lake, we had fun using the kayaks, paddle board , swim float, and even enjoyed some fish we caught while canoeing! We would most definitely come back again! Stacy, thanks so very much for making our family vacation so special! It was a pleasure welcoming you to Clear Lake Lodge, Tamara. :-) We are so happy you were all able to enjoy the beauty of the lake and make use of the kayaks, paddle board and swim float. Fish always tastes best when you catch it yourself! We hope you come back again to enjoy any of the four seasons! From the very beginning this was the start of a wonderful, relaxing vacation! Stacy the property manager was so easy to work with. We arrived and the cabin was gorgeous!! High end kitchen appliances. The furniture was new and beautiful! No expense was spared to outfit the cabin. The lake was incredible!! Crystal clear in the middle of August! It was a very quiet lake so it was extremely relaxing! I have a 8 and 12 year old and they were able to use the kayaks and paddle board with no concern for safety as the lake was a small and quiet lake. The VRBO description does not tell you so it was a fun surprise- there is a new floating raft included. Hoping we will be coming back next year. Thanks for a great week, you have a beautiful property! We are pleased you were so thrilled with the cabin and what it has to offer. It's wonderful to know that you felt comfortable letting your children enjoy the kayaks and paddle board without worry - definitely a plus on a smaller, quiet lake! When you are ready for a relaxing vacation again next year, we will be happy to welcome you back! Gorgeous setting and beautiful home! Everything was perfect! Plenty of room, clean and very comfortable! Owner was great, attentive while we were there, checking in with us to make sure everything was ok or if we had any needs. I was able to contact her any time I had a question. Lake was quiet, very peaceful and relaxing. Kids loved having the kayaks and paddle board to use. Adults loved that they could be out on the lake without worrying as the motorized activity on this lake was minimal. All in all, a wonderful vacation spot! Highly recommend!! We had a wonderful week on Clear Lake! The cottage was actually more like a home and one of the nicest that we have stayed in the past 8 years. It was well stocked, clean and welcoming. Stacy was very helpful with little details and very quick to respond when we had a question. We have a family of 6 and there was ample room for everyone. The kids especially enjoyed the game room. Swimming was great - nice clean water. We really loved the swim raft. We brought our own boat so the kids could tube and ski. The lake is a tad bit too small if you want to do a lot of water recreation, but we made it work - perfect if you just want to pull the kids around on a tube. Plenty of space both inside and outside this property. I promise that you will not be disappointed! We are so happy you and your family had such a great time at Clear Lake and that I was able to help with any questions you had. :-) We are glad you were able to enjoy the lake and had ample room for everyone in the Lodge. Thank you for recommending Clear Lake Lodge as one of the nicest that you have stayed at in the last 8 years!